Kasganj communal riots that claimed the life of one young Hindu boy, Chandan Gupta, refuses to die down. It seems every media house is trying their best to peddle a side of the story that is most convenient to their political preference. We had reported the different versions that have emerged in the media. We also reported how Chandan’s father was now getting threats based on an ANI story. But clearly, Chandan’s father getting threats after his son was brutally murdered in communal violence wasn’t a narrative that sat well with sections of the media. Pro-AAP blog, JantaKaReporter, earlier today came up with a ‘report’ that claimed that the ANI story was false. While this wasn’t unexpected from JantaKaReporter that has been exposed several times by us, it was also not unexpected when controversial ‘journalist’ Rajdeep Sardesai quoted that report and asked journalist to collectively hang their hand in shame. 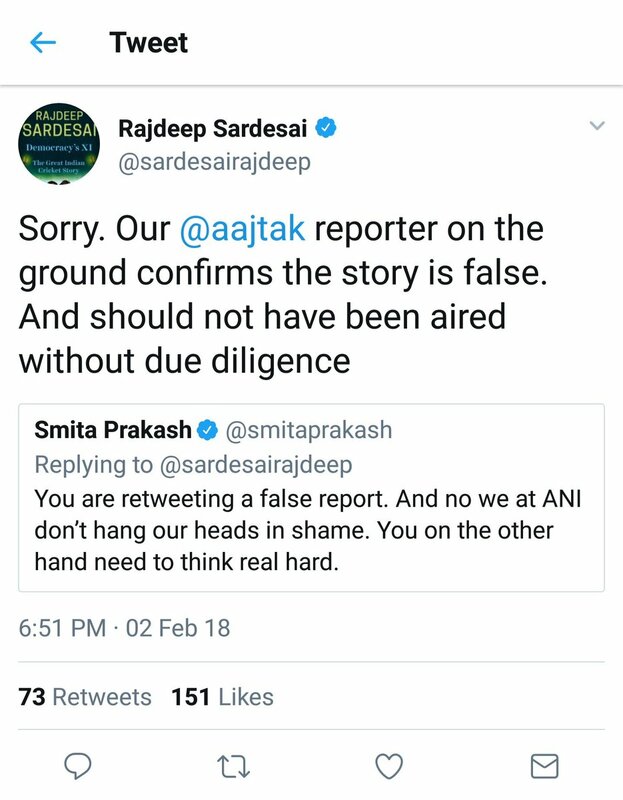 Smita Prakash, the Editor of news agency ANI responded to Rajdeep Sardesai and informed him that he was tweeting false reports, which again, wasn’t very unsurprising. She also lashed out at Rajdeep Sardesai and informed him that ANI had double checked its report and stood by it. 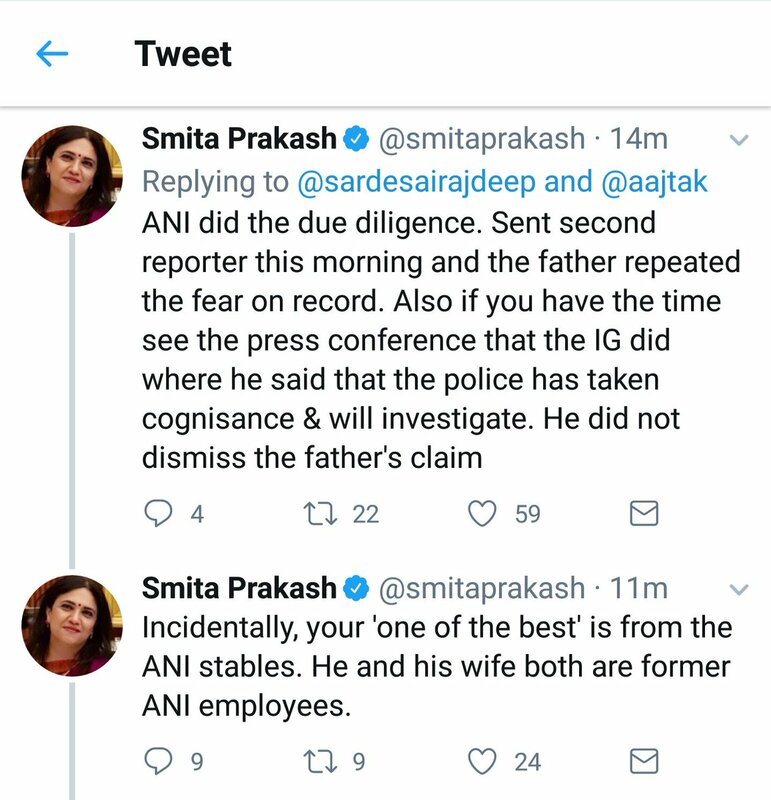 Regardless of Smita Prakash informing Rajdeep Sardesai that the story has been double checked, Rajdeep stuck to his guns and insisted that the story was false. 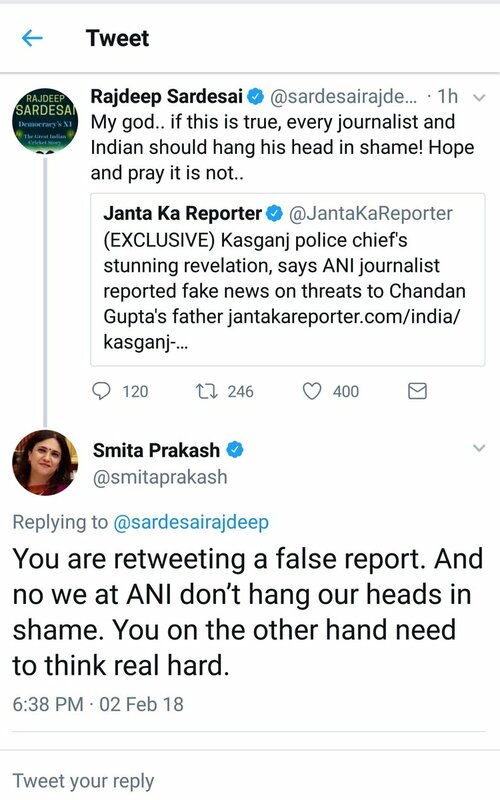 While Rajdeep Sardesai insisted that ANI story was false and chose to trust an unnamed ground reporter that he claims confirmed that the story was false, Smita Prakash and team put out a video where Chandan Gupta’s father himself is on video talking about the threats he has been receiving. ANI has also tweeted a video where the IG of Public Grievances says that the police is in constant touch with Chandan’s father and if he files a complaint, strict action will be taken against the culprits. It is thus tragic that journalists like Rajdeep Sardesai and Rifat Jawaid who are actually propagandists masquerading as journalists, would rather spend their energy and resources trying to debunk with lies, the version of a grieving father; a father who has just lost his young son, and is now receiving threats. This episode has not only exposed yet again the shoddy journalistic standards practiced by the likes of these two, but also the wide divide between the Media fraternity. Between reporting facts, and peddling propaganda. Between reporting truth and twisting the truth, to suit a pre-defined agenda. Rajdeep and Rifat seem to firmly believe in the “if the facts don’t fit the narrative, change the facts” maxim. Perhaps that is what Rajdeep fondly calls the ‘moral compass’. We hope their heads hang in shame, though, we are not holding our breath.